Being a fanatic fan of mystery novels and suspense dramas, it was with obvious delight that I started reading this book. The appealing bright red cover design with the yellow embossed title declaring its mystery in a bold way, made me more apprehensive of what was awaiting inside. Also, the delightful south Indian names of the various characters illustrated briefly on the back-cover perked up my interest more. The protagonist of the story, the chief constable Venkat Reddy, lands into a genre of investigation he had never laid his hands on- murder of the village 'hostess' or prostitute Padmavati in the village of Amaravati. 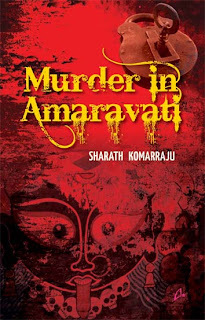 From the very first chapter, with the intricate details of the village, the banyan tree than stood at the heart of it, the soft gurgle of the Krishna river that stroked the banks of the village relentlessly; Sharath Komarraju displays an effortless writing style and even the detailed description of the morning chores of the village priest ,Krishna Shastri was far from boring. The discovery of the body in the locked temple before the idol of Goddess Kali was a mere beginning to the series of other intriguing discoveries. Like the fact that almost all the revered and respected male members of the village society seemed to be a customer of the dead woman, including the Sarpanch. The best parts in the story were the efforts the author took in building up the background of the different characters in the story. And looking back, it seems as though the personalities of these people was very much in sync with real life. You have the Sarpanch Seetaramaiah, who at a first glance appears to be emboldened with respect and fear from the villagers but behind the facade lies a man desperate for love, understanding holding a sad past. Shekhar, the cripple with a devoted wife posed a decent and sympathy inducing figure in the mindset of the villagers but there emerged circumstances in his life that apparently made him approach the village 'hostess' too. Satyam, the postmaster with a respectable family background, with a son the whole village was proud of also had a double faced life which customarily mean having an affair with Padmavati. Lakshmi, Satyam's wife was a regular Indian housewife- devoted to her husband and determined about saving her husband from any possible shadow of suspect but at the same time having a God-fearing and justice seeking cultivated mind. Vaishnavi, Shekhar's wife on the other hand is an enigma throughout the story. Beautiful and mysterious, she shows a myriad of emotions and moods in the fast pacing novel. Kishore, the sarpanch's son and Indira, his crippled sister, are shown as doting siblings with each one of them bearing their own burdens of past and present. Racing over 209 pages, the story is definitely pacey. There is something about the unusual murder happening in a small uneventful village, the realistic characters of the story and the possible association of all main characters with the murder that demands your undivided attention. Also, the small shlokas inserted in between the story gives a disarming ancient touch to the story and shows the spiritual mindset and orthodox writing style of the author. Coming to the facts of the story itself, I felt as though some things had been highlighted incessantly again and again over the story till it becomes evident that it is in some very important way related with the murder. Like the figure of Shekhar on his wheelchair seen at the river bank being highlighted in the evidence of few people. The bracelet of Vaishnavi being found at Padmavati's place and also, the sudden turn in the behavior of a few characters of the story pointed the climax in a very obvious direction. Also, having only TWO cripple with wheelchairs with one of them a prime suspect in the case was also very convenient. All this pointed the story in an obvious direction. But despite that, the story lead me straight to the end with nervous apprehension all the same. The epilogue which I am sure the author meant as a third twist in the story, didn't pop up as something impressive in my eyes. It felt as though the motive which had been holding strong till then had suddenly gone weak. The shortcoming of the story in my opinion would be how the role of the protagonist dramatically changes hands from the constable Venkat Reddy to the village pandit Krishna Shastri in the very ending chapters of the novel. It strcuk a negative chord in my mind- however inexperienced, you dont really like if the young Sherlock of the story appears to be misled by his own methods of finding the murderer. Also, the direct accusations which were made on almost ALL the main suspects of the story went down with me. The detective flinging his aura of accusations one by one on everyone and letting them rule out the suspicion THEMSELVES rather than with concrete evidence didnt go well with my digestive system. Overall, with the good narrative style and delicate finesse each character in the story was served with, makes this novel certainly a good read. But if I had to answer the question Venkat poses in his mind about whether he would make a good detective if the story were a novel, I would have to answer in the negative. hence, I would rate this book a 6.5/10 and would definitely suggest anyone interested in mystery novels have a look at it. A straight up and honest review. I agree with most of the points you have told, and even I would suggest the book to a mystery lover. I'd rated it a tad higher, but it's still in the same range I suppose. Having read both your and Leo's reviews of the book, it seems like a good read but still has its own deficiencies. Nicely reviewed ns, though you gave away too much in it I feel!!! PS - Keep book reviews short and crisp, I told Leo the same thing! Nice reading a third review of the same book and seeing the subtle differences in perception. Hmm. Sounds interesting. But thoda spoiler alert de. :P Now let me finish my already lined up books, will read this then. Well written review. I did feel the same about the ending part - where the constable loses out to priest. Definitely this could have been handled in much smoother way. PS: loved the title of your blog.